Happy MONDAY and welcome to a new week in November! Remembrance Day is tomorrow here in Canada. We will take the day to remember the many brave people that have lost their lives for Freedom in our country. (This great video is one that I will share with my young children.) After tomorrow, we will begin decorating Our DIY House for Christmas 2014. I’m so excited to spend our second Christmas together as a family in our new home! This week, I’m going to share with you some really simple DIY handmade Christmas tree ornament ideas that you can make inexpensively (or for free) this year. Rather than buying a ton of new ornaments, I thought it would be fun to upcycle and hand make some cute and fun ornaments with my kids. At the end of the week, I’ll share something unique that I’m doing with our homemade ornaments (before we put them on the tree, of course). Today’s DIY handmade Christmas ornament idea is a Christmas tree snow globe… in a baby food jar! We have a gazillion baby food jars stored away because of dear Baby B, so I’ve been brainstorming all of the interesting crafts I can make with them. 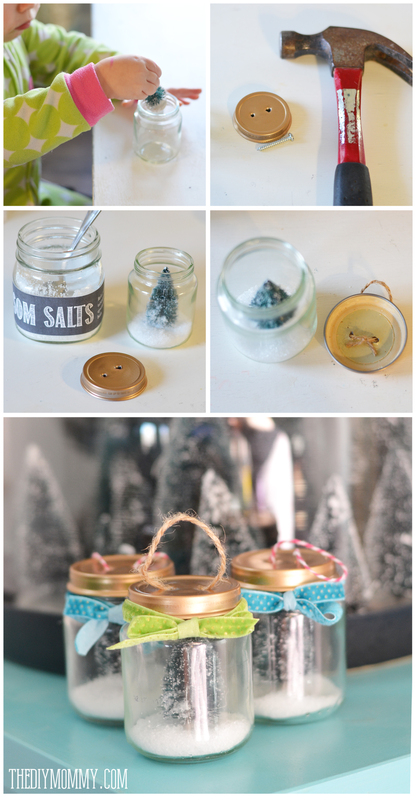 I found this idea here, and I changed it up a little by using epsom salt as my faux snow. My girls LOVED to make these with me. We left some simple & plain like the ones on Simply Ciani, and then we decorated some with ribbon from May Arts wrapped around the necks of the jars. What do you think? Aren’t they sweet?! They’re such a fun kid’s craft too. Come back tomorrow for another handmade Christmas ornament idea! These are too cute!! I can’t get enough of bottle brush trees! Thanks so much, Virginia! Me too – bottle brush trees are SO darn cute and I love the DIY ones you made last year! These are just the cutest. I wish I had kept some baby jars from when my kids were little (which wasn’t that long ago! ).